AT LEAST 1,000 people have been evacuated from homes near the popular holiday resort of Benidorm after a "suspicious string of fire" broke out. The blazes erupted in Xabia, south of Valencia, 29 miles from the bustling tourist destination of Benidorm. Police are investigating the cause of the fire, which they are describing as "suspicious". Thousands of locals were evacuated by the Civil Guard. 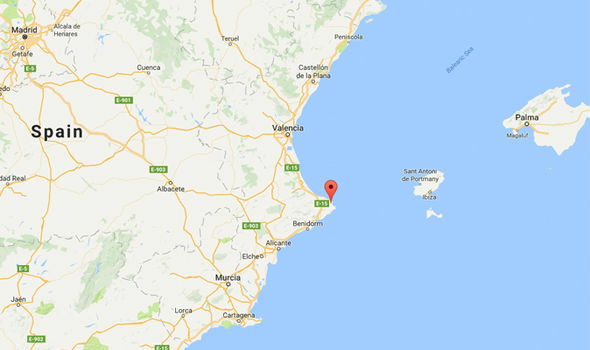 Spanish police had to arrest one homeowner who refused to be evacuated. Radio One DJ Chris Stark posted a video on Twitter appearing to show the terrifying blaze near the town. In the video, he says: “Take a holiday, they said. “Come to Xabia, it’s a lovely place. “I’m in Spain and I’m only laughing because I could cry. “There’s a fire right now, right behind my apartment. Express.co.uk has contacted the Foreign and Commonwealth Office who cannot confirm or deny that any Britons have been affected by the blaze at this stage.